Rouen Metropole Basket (ProB) inked 27-year old American (has also Liberian passport) guard Lasan Kromah (198-92kg-91, college: Connecticut). He already started the season at Boulazac Basket Dordogne (ProA). In four games he recorded 4.8ppg and 1.3rpg this season. ProB will be definitely a better match and he can see more playing time. The last season Kromah played at U-Banca Transilvania Cluj Napoca (Liga Nationala) in league. The team played in three different competitions (!!!) that year, and he had a chance to explore basketball on different levels. 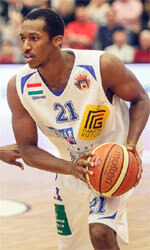 In 35 Liga Nationala games he averaged 11.3ppg, 3.0rpg, 2.3apg and 1.8spg (in top 3). Kromah helped them to win the cup and make to league semifinals. He also played 14 games in FIBA Europe Cup where he got impressive 15.4ppg, 3.7rpg, 2.4apg and 2.1spg. A very good season in his career as he was voted to Eurobasket.com All-FIBA Europe Cup Honorable Mention. Kromah also played 2 games in Basketball Champions League where he got remarkable 20.0ppg, 3.0rpg, 2.5apg and 1.0spg. Two years ago (two years after he left the college) Kromah was drafted by Westchester Knicks (D-League) in third round (60th overall). The former University of Connecticut staris in his fifth season in pro basketball. Kromah has tried to make it to the NBA and played in the NBA Pro Summer League in 2014. He won NCAA championship title in 2014. Kromah is a very experienced player. He has quite traveled the world as his pro career brought him to four different countries on three different continents (Europe, Australia and of course North America). Kromah has played previously professionally in Australia (United), Greece (Kavala and Promitheas), Hungary (Kormend and Alba) and Turkey (Konyaspor). His game is described as: He can rebound, defend, pass. He's really capable of taking over games offensively. He gets a lot of recognition for his outside shooting, but he just finds ways to score. He has a real passion for basketball and just loves to play. Team FOG Naestved (BasketLigaen) tabbed 28-year old American (has also Liberian passport) guard Jeremy Williams (185-91, college: New Haven). He played most recently at Sorgues BC in French NM1 league. In 11 games he averaged 10.1ppg, 1.7rpg, 3.8apg and 1.4spg last season. The previous (16-17) season Williams played at Fundacion Globalcaja La Roda (EBA) in league where in 16 games he had 10.1ppg, 2.6rpg and 2.2apg. He helped them to win the Spanish EBA Final Stage 1 title. Williams has played previously professionally in UBA (Ohio F.). Williams attended New Haven University until 2013 and it will be his sixth season in pro basketball. BC Siauliai (LKL) agreed terms with 25-year old American (has also Liberian passport) point guard Saah Nimley (173-71kg-93, college: Charleston Southern, agency: Blacktop Management). He already started the season at Zornotza in Spanish LEB Silver. In 6 games he had very impressive stats: 19.2ppg, 2.7rpg, 4.8apg and 1.8spg this season. The last season Nimley played at Newcastle Eagles (BBL) in league where in 36 games he recorded also remarkable stats: 17.8ppg, 3.3rpg, 5.5apg and 1.6spg. The list of the past achievements is quite long as among others his team won Big South Conference South Division Regular Season in 2013. Nimley was also voted All-Big South Conf. Player of the Year and NABC All-District 3 1st Team back in 2015 at his college time. 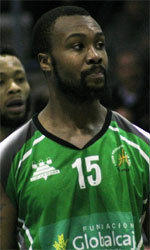 Nimley has played also professionally in Finland (Vilpas), United Kingdom and Lithuania (Nevezis). He attended Charleston Southern until 2015 and it is his fourth season as a professional player. On Nimley: All American honourable mention, Big South player of the year, #5 in NCAA in scoring with 21.3ppg. Lightning quick guard who can get by his defender at will - combined with deadly long range shooting, often from 8-9meters. Tough scoring guard who also creates open shots for his teammates due to his quickness. Great professional work ethic.